When you have an family member with an addiction like alcoholism, it is very difficult. The alcoholic may admit that they have a problem and seek help, yet relapse again and again. Or the alcoholic may be unwilling to admit that they have a problem and get defensive when you imply that they do. Regardless of their reaction, you can be left feeling helpless or angry or fearful or sad. How do you interact with someone who places such a high priority on alcohol, sometimes placing it above even their family members? How do you rationalize with a drunk person? Will they ever really get sober? Should you confront them? How can you support without enabling? These are all questions that family members of alcoholics are faced with answering. First, it is important to understand their relationship with alcohol. Alcohol has become something that they feel they need in order to live. Their body is so accustomed to the presence of a certain blood alcohol level that they can no longer function properly without it. As food is to us, alcohol is to them. If your alcoholic family member were to quit drinking, they would experience many physical and psychological withdrawal symptoms which would make it very difficult for them to abstain from a drink. So imagine that someone is trying to come in between you and the ability for you to ever eat again. You would likely react in much the same way - avoidant, defensive, angry, etc. This leads me to my second point, an alcoholic realizes that in order to stop drinking, they would have to give it up forever. It is not that you’re asking them to give it up for one day or even one week. You are asking them to imagine a life without it. It feels overwhelming and unfathomable to them that a life like that would be possible. Sometimes they feel that life would be boring that way. This is why AA promotes the saying “one day at a time”. A recovering alcoholic must take one day at a time, meaning just don’t drink today and don’t think about tomorrow or next week or next year. If they begin to think about never drinking again, they may throw in the towel because that just feels too difficult. First, it is important for you to have personal boundaries for yourself (and your spouse and/or children). You need to ask yourself questions such as: Am I okay with this person drinking at my house? Am I content to be around this person when they are drinking somewhere else? Do I want my children to be around this person when they are drinking? Will I buy this person alcohol if they ask? Will I have give this person money if they ask? What am I willing and not willing to do for this person? The list of questions varies depending on your relationship with them, whether or not you have children, and the severity of the person’s drinking problem. Regardless, of your circumstances, you need to put boundaries which state a consequence for breaching the boundary. 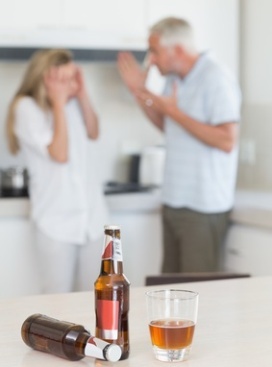 An example is, “I will not allow you to drink alcohol in my home and if you do not respect that, the consequence is that you will be asked to leave my home.” Another example is, “If you drink around my children, you will not see my children any more.” These boundaries should take into account the physical, emotional, and spiritual safety of yourself (and your children) as well as thinking about the best interests of your family member. Second, have a plan for supporting the person without crossing the line into enabling the person. Supporting someone is doing what is best for them and helping them when they are doing what is best for them. Enabling is doing what the person wants even if it is not helping them to overcome their weaknesses, addictions, etc. It is, in essence, aiding their addiction to continue. A good example is giving the person money. You may have a family member, for instance, that is an alcoholic and spends a lot of money on their habit. As a result, they may not have much money left at the end of the week for food or gas. They may come to you asking for money for food or gas, not for alcohol. However, if you give them money, they never have to address the real reason why they don’t have money – they spent too much on alcohol and did not prioritize their spending. Do not feel the responsibility to free them from the consequences of their actions. Running out of money is a consequence. If they don’t experience the fullness of the consequence, there is no motivation to change their behavior. Be careful not to take away their experience of their consequences. When it comes to confronting the person about their drinking, you have to tread lightly and wisely. Remember what was stated above about the person’s relationship with alcohol and keep that in mind. It is easy to get accusatory and angry with the person but that won’t likely be effective. The best approach is to share your heart with them in a way that shows you love them, are concerned about them, and want to support them reaching their full potential in life. Tell them how their drinking affects you but share it with a hurt heart rather than an angry heart. This may take some practice. Tell them that you believe in them and want to see them succeed and that you’ll support them in the process. If the person is not willing to accept help or to admit their problem, there is little that you can do. You will continue to set boundaries and continue to share your heart with them. Outside of this, the choice is ultimately theirs.